West River Road between Plymouth Ave. & Broadway Ave.
Join us for the Aquatennial Blood Drive and help give back to your community during The Best Days of Summer! The Aquatennial Blood Drive is brought to you by the American Red Cross in partnership with CBS Radio. Sign up in advance through the online registration (coming soon), or stop by the day of the event. The Aquatennial Blood Drive will take place 9 am-3 pm. There is currently a large shortage of blood donation, so your gift during Aquatennial will make a big impact this summer. Learn more about the American Red Cross. Don’t miss out on Go Outside with Hennepin County activities during Aquatennial. Each Wednesday throughout the summer, Go Outside transforms South Plaza into an outdoor recreation room during your lunch break. The space features special pop-up activities each week, yard games, a meditation room with colorful blankets and yoga mats there for you to enjoy a brief get-away, and the Pianos on Parade piano if you’d like to play a song or two. These events take place each Wednesday from June 1 through August 31, so be sure to enjoy Go Outside with Hennepin County throughout the summer. To learn more, visit www.mplsdowntown.com/gooutside. The JB Hudson Family Fun Fest is a FREE family-focused event hosted by the iconic JB Hudson Jewelers located in the heart of downtown Minneapolis. Celebrating the legacy of Aquatennial and the history of Minneapolis, this event gives your children a chance to create with lots of fun hands-on crafts and demonstrations. Activities include beading projects, color-your-own tiaras and watches, rock painting and a family photo station, plus hot dogs and cool treats. The JB Hudson on-site goldsmiths and watchmakers will also have live demonstrations. Loring Park Family Fun Night is a family focused event held just blocks from the CenterPoint Energy Torchlight Parade. Activities & Booths include: Free Wilderness Inquiry Voyageur Canoe Rides, free tennis lessons with USTA, food trucks and many more family-friendly activities to be announced soon. Find your seat for the parade and bring the family down for some fun! Learn more about Citizens for a Loring Park Community, and follow them on Facebook. Free voyageur canoeing and paddling instruction open to people of all abilities, including people with disabilities. Experienced Wilderness Inquiry guides will provide all equipment needed, ensuring a safe and fun experience for all. Click Here for more information on Wilderness Inquiry Voyageur Canoe Rides. Presented by USTA Northern, Rally the Family focuses on tennis for all ages, using lower compression red, orange, and green balls, shorter courts, shorter racquets and modified scoring, along with a focus on families spending time together in fun, healthy activities. Stop by from 6-8:30 pm! Click Here for more information on USTA Northern, or check out their Facebook page. They’re also on Twitter and Instagram @USTANorthern using the hashtag #Aquatennis. Whether you are a dedicated runner or just someone who jogs from the couch to the fridge, the Life Time Torchlight 5k in Minneapolis is the fun run for everyone! Grab your family, friends and running shoes because the Torchlight 5k starts with a bang and ends with a brew. That’s right, Life Time Fitness’ legendary post-race party features musical entertainment and complimentary refreshments. Then take the NEW shuttle bus system back to the start area. It’s the party of the year that just happens to start with a run! The Torchlight 5k starts near the historic Basilica of Saint Mary and follows the Aquatennial’s CenterPoint Energy Torchlight Parade route. The course offers up close views of the Guthrie, Gold Medal Park, the Mighty Mississippi, Stone Arch Bridge and St. Anthony Main. Sign up today at www.torchlight5k.com. Follow along for updates on Facebook or on Twitter by following @Torchlight5k and using the hashtag #Torchlight5K. 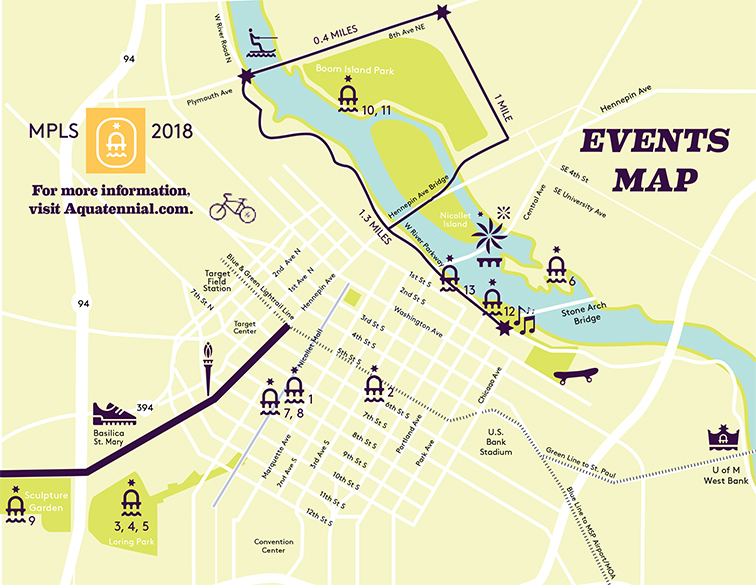 Join us for the Aquatennial’s CenterPoint Energy Torchlight Parade, set to take place Wednesday, July 18 at 8:30 p.m. Join the community as they gather and watch great floats, displays and bands march through the heart of Downtown Minneapolis. This is CenterPoint Energy’s 18th year being part of the Aquatennial and sponsoring the CenterPoint Energy Torchlight Parade. Come down and celebrate on July 18! Arrive early, find a spot along the parade route and enjoy! The Minneapolis Aquatennial CenterPoint Energy Torchlight Parade has been a longstanding Aquatennial tradition. As a flagship Aquatennial event, the parade continues to grow. The CenterPoint Energy Torchlight Parade is the largest nighttime parade in Minnesota. We’re excited to see you at this year’s event! Learn more about this year’s CenterPoint Energy Torchlight Parade here! Stop by the Downtown Farmers Market during Aquatennial and enjoy great local produce, vegetables, flowers and much more. The Farmers Market is located along Nicollet and is open 6 am-6 pm each Thursday from May through October. For more information, visit www.mplsfarmersmarket.com. Hennepin County Government Center South Plaza hosts weekly piano performances by members of our community each Thursday from 12 pm-1 pm beginning June 6 through August 29. Stop by and enjoy great music while you’re taking in the fun activities throughout Aquatennial. More info: www.mplsdowntown.com/gooutside. Join us for an outdoor trivia night at Target Field Station courtesy of Go Outside with Hennepin County! Outdoor trivia nights are free and open to all ages. Bring your team and face off against other groups as you test your general trivia knowledge with chances to win great prizes on the line. Target Field Station is located on the northwest side of Target Field, near Gate 6 and the light rail platform entrance. Bring lawn chairs or blankets and find a spot on the green grass for a fun outdoor trivia experience. Enjoy! Join the Twin Cities River Rats for a humorous, family-friendly water ski show on the Mississippi River. Watch high-flying stunts, fast-paced barefooting, graceful swivel skiing, and even human pyramids courtesy of the talented Twin Cities River Rats crew. Bring beach towels or lawn chairs and enjoy this free water ski show for the whole family along the banks of the Mississippi River – located just south of the Broadway Bridge. The River Rats will be doing shows at 7 pm on Thursday, July 25. Alchemy 365 combines yoga, strength, and conditioning into one class to change the body and renew the mind. Join us in the Minneapolis Sculpture Garden for a fun and challenging A10 class. Think: power yoga warm-up, 10 minutes of high intensity bodyweight movements, power yoga cool-down. This workout is for all fitness levels and all are welcome! Bring a yoga mat and water. Join us at the Minneapolis Sculpture Garden (726 Vineland Place) on an early July evening to take in the weather and the atmosphere that comes with the Minneapolis Aquatennial. Celebrate summer in the City! This class is free and open to all abilities. Check-in begins at 4:30 pm. Mats are not provided for this class. No pre-registration required, come early to reserve your spot. Click here to learn more about Alchemy 365. Since 2000, Loring Park Art Festival has combined creative expression and community connectedness to surprise and delight all who attend. With beautiful ponds and formal gardens, Loring Park makes an idyllic spot to celebrate art, music, food and entertainment for two days each summer in downtown Minneapolis. The event features 140 visual artists selling original work, with something for everyone. Visitors will encounter strolling musicians, scheduled stage performances, engaging children’s activities and adventurous culinary options. This year, the Loring Park Art Festival will feature the Lakes & Legends Beer Garden. The Loring Park based brewery, Lakes & Legends Brewing, will serve craft beer, local craft soda and Kombucha on site throughout the festival’s duration. The beer garden will offer seating as well as a variety of lawn games. For more than two decades, Twin Cities Carifest has been the premier Caribbean Festival featuring Caribbean food, music, arts, crafts, and a traditional carnival parade with colorful costumes and dance. Held along the banks of the Mississippi River, you can see the Minneapolis Aquatennial Target Fireworks! Follow Twin Cities Carifest on Facebook or on Twitter for more information. Join the fun for the Aquatennial Pre-Fireworks events leading up to the Target Fireworks at 10 pm. Stop by for music, food and more as you await one of the nation’s top five annual fireworks shows. Join the Minneapolis Aquatennial in celebrating another year of with the Target Fireworks, considered one of the top five annual fireworks displays in the nation. The event will take place at 10 p.m. on Saturday, July 21. Get there early! Space fills up pretty quickly at this beloved event along West River Parkway and on the Stone Arch Bridge. Music and activities run from 6-10 pm. Viewing Tips: Come early to get your viewing spot—bring sunscreen for the afternoon and bug spray for the evening. The best spots are between Gold Medal Park and the 3rd Avenue Bridge on West River Parkway. While you’re there: Enjoy a show, tour or walk on the Endless Bridge at the Guthrie Theatre, learn about Minneapolis’ history at the Mill City Museum, enjoy a morning at the Mill City Farmers Market or a leisurely afternoon at Gold Medal Park. Stop by Stone Arch Bridge and check out the skyline view from the Mississippi River. And tune into Go 96.3 and enjoy the simulcast of music set to the Target Fireworks display.